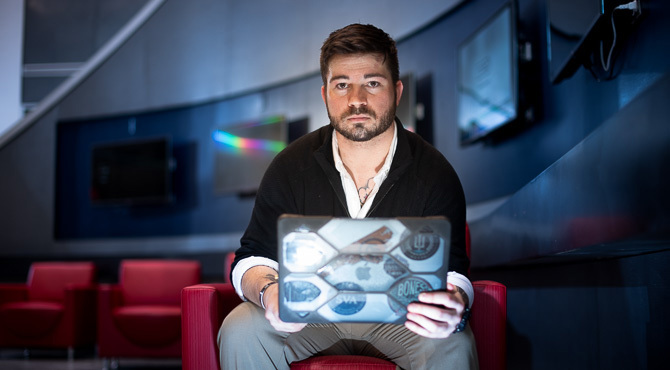 He served his country as an infantry Marine, and now Jay Richardson ’20 has turned that sense of duty toward a career defending the nation’s cyber networks. Richardson, one of more than 2,100 military-affiliated students at UNCW, plans to earn a degree in computer information technology with a cybersecurity minor. The university was recently recognized as a National Center of Academic Excellence in Cyber Defense Education by the Department of Homeland Security and the National Security Agency, a designation that will help UNCW students compete favorably for jobs in a growing and increasingly critical field. Richardson became interested in a cybersecurity career after a veteran friend, who was president of the UNCW Cyber Defense Club, asked him to join. “When I first started, I had no idea what any of the terminology, tools, tactics and techniques were, but it looked like fun, so I poured hours into my own research to understand what was going on during meetings,” Richardson said. He credits UNCW faculty and staff for helping him succeed, both academically and socially. Transitioning from the military to college life can be daunting for veterans, and they need guidance as well as peer groups who share their experiences, Richardson explained. UNCW’s Student Veterans Organization and the Office of Military Affairs have worked to help new student veterans stay informed and prepared, he said. Faculty and staff across campus play a key role in creating a welcoming climate for veterans and other nontraditional students. Richardson, too, is making an impact as an active member of the UNCW Student Veterans Organization. From more than 2,000 Student Veterans of America chapters, he was one of 100 members selected to attend the national organization’s Leadership Institute in Washington, D.C. The institute was held around the same time Hurricane Florence forced UNCW to cancel classes for nearly a month. Realizing that time away from class could cause G.I. Bill students to forfeit or have to repay their fall semester benefits, Richardson took it upon himself to speak with a top VA official while in Washington. He secured a promise – first in person, then in writing – that UNCW students would not lose their benefits because of Hurricane Florence, said UNCW Military Affairs Director Bill Kawczynski. “Jay has developed excellent leadership skills,” Kawczynski said. Richardson said he will continue to work on behalf of veterans while pursuing his career.